Running a business from home can feel a bit overwhelming. Many consultants, distributors and reps aren’t really trained on how to run and grow a business, and not every organization offers coaching and guidance on this learned skill. One of the most challenging parts of growing a business is learning how to promote yourself and what you do without feeling promotional and salesy. I’ve said it before, but I’ll say it again: Growing an at-home business is all about building relationships with others. It’s about showing you care and talking to others in a way that gets them to open up and share. And then, after you’ve established the relationship, should you share about your business. You’ve seen the posts on Facebook and Instagram. You’ve probably gotten some emails and private messages too. I’m talking about the messages and posts that some direct marketers make, announcing a “great new business opportunity” and “PM me for more info.” It’s a blanket message that’s not really meant for a specific person, so therefore it lands flat with everyone who see it. A better approach is to think about the people in your life and listing all the people who would benefit from the product or service you’re offering. If your product is health or fitness related, you can help your Aunt Joyce by introducing her to something that will help her arthritis. You can help your friend stay hydrated when she exercises or your best friend’s dad who had a heart attack last year and is now trying to lose weight. Similarly, your tennis or hiking partner clearly care about their health. Chances are they probably already purchase products from a health food store so they’d be interested to see what else the market has to offer. There’s a connection there between their needs/interests and what you have to offer.. If your product is in the beauty industry, you can help your cousin who’s struggling to feel good about herself after having two babies and could use a makeover. Or your mom who’s fighting wrinkles with everything she’s got. And both of them probably care about safer cleaning products, if that’s what you’re promoting. Make a list of all the people you know. Not just your best friends, people you know. Friends, family, acquaintances, business associates, everyone. You can even list people who you have met once and would like to connect with again. The purpose of the exercise is to brainstorm. Once you have a list of 30-50 names, write down how you can help each one of these people. Make a connection between who they are and their interests and what you’re promoting. Use the above example as inspiration. You wouldn’t want a stranger to walk up to you in the supermarket and start telling you about a great new product they know about. That would feel awkward and uncomfortable. So when you’re starting a new business or wanting to expand one you’re already in, start by talking to the people closest to you. Your immediate family and your best friends are great resources for testing out your relationship skills and practicing talking about your business. Approach these people with a desire to help them. Find a way to meet the need that they have. Once you’ve honed your skills a bit, go talk to people you don’t know as well. Your neighbor, your daughter’s best friend’s mom, your hairdresser. Approach them with a desire to connect further and help them–or share something of interest to them. Here’s what that approach might look like. Your Hairdresser: My son has soccer practice on Tuesday, but I don’t have anything Thursday night. Why? You: I know your son has asthma and that you try to keep your home clean and free of those harmful chemicals. I’m hosting a wellness event and one of the areas we are covering is how to get toxic chemicals out of the home, without breaking the budget. I’d love to have you come. I think you’d really appreciate the education and learning how your family might benefit. You offered them a choice. You’ve found out if they’re available, then offered them an event where you can connect more and they can get help for a challenge they’re having. It’s all about focusing on what’s in it for them and fostering a deeper relationship. 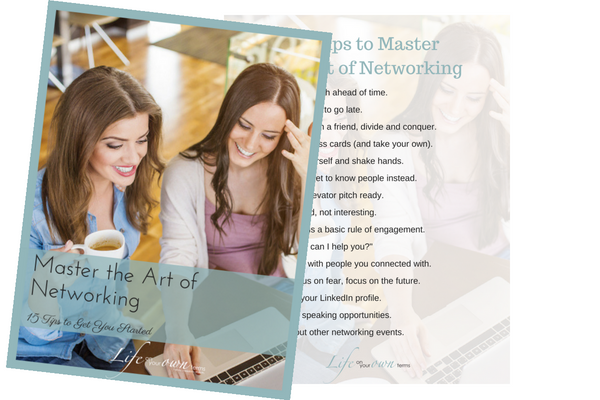 Of course, if you’re growing a business you’ll meet people through networking as well. Sadly, too many people go into networking events with the sole mission to pass out as many business cards and shake as many hands as they can, and expect/hope that those new contacts will call them later. Think about what you do with business cards from a faceless networker. You probably look at them after your networking event, wonder who the people even were, then promptly toss out the cards. I know that’s what I do when I’m just handed cards without a true conversation. Instead of this old-school practice, make a true connection with the people you meet. Find out about their family, their jobs, their hobbies. Show a true interest in who they are and what they do so you can follow up with a real, authentic response. For more networking tips, watch my free training! I know what you’re thinking: I don’t know very many people. I can’t do all this. Yes you can. Even if you’re new to town, even if you’re an introvert. You talk to people every day at the store, while picking your kids up from school, even on social media. Ask questions. Get to know them and you’ll probably find a way you and your business can help them lead a happier, healthier, more fulfilled life. Even if the relationship doesn’t lead to a new customer, you’ve at least made a new friend!